Banana Shakes – Vanilla milkshakes are for the boring — but you’re not boring, so you add a banana to every shake. Take that, monotony! 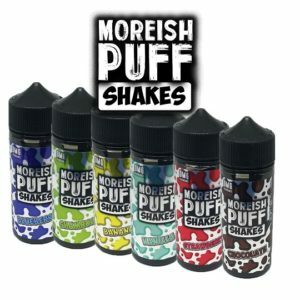 Banana Shakes by Moreish Puff adds a touch of sweet banana to an irrisistably creamy milkshake base. Blueberry Shakes – Blueberry ice cream — it might be great to eat, but it’s even better blended into a milkshake. With notes of blueberry juice, vanilla ice cream and cold milk, Blueberry Shakes by Moreish Puff is pure, cold, fruity refreshment. Chocolate Shakes – Vanilla milkshakes are always nice. Fruity milkshakes? They’re fine. If you ask us, though, chocolate is the only flavour that really matters. If you’re with us, try Chocolate Shakes by Moreish Puff today. Shamrock Shakes – There’s nothing quite like a shamrock shake when St. Patrick’s Day rolls around. If you spend all year looking forward to that delicious amagalmation of vanilla ice cream, mint and green food colouring, enjoy the experience right now with a bottle of Shamrock Shake by Moreish Puff. Strawberry Shakes – If you’re not in the mood for a vanilla or chocolate milkshake, we guarantee that strawberry is the flavour that’s on your mind. Why wait? Indulge in a bottle of Strawberry Shakes by Moreish Puff right now. Vanilla Shakes – Your exploration of milkshake e-liquids begins right here. 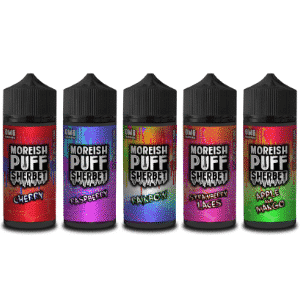 With notes of rich ice cream, sweet milk and bold vanilla beans, you won’t find a better milkshake e-liquid than Vanilla Shakes by Moreish Puff.